If there are two truisms in the area of physiological computing, they are: (1) people will always produce physiological data and (2) these data are continuously available. The passive nature of physiological monitoring and the relatively high fidelity of data that can be obtained is one reason why we’re seeing physiology and psychophysiology as candidates for Big Data collection and analysis (see my last post on the same theme). It is easy to see the appeal of physiological data in this context, to borrow a quote from Jaron Lanier’s new book “information is people in disguise” and we all have the possibility of gaining insight from the data we generate as we move through the world. If I collect physiological data about myself, as Kiel did during the bodyblogger project, it is clear that I own that data. After all, the original ECG was generated by me and I went to the trouble of populating a database for personal use, so I don’t just own the data, I own a particular representation of the data. But if I granted a large company or government access to my data stream, who would own the data? Physiological data are constantly generated by the brain and body and I believe these datasets to be subject to the same copyright considerations as other intellectual property, such as written words, drawings etc. In other words, physiological data be recognised as the property of the individual. Unlike intellectual property, the individual doesn’t have to necessarily do anything to generate these data, so perhaps it doesn’t fall into the same category. On the other hand, recognising physiological data as personal property is one way to safeguard the privacy of individuals against “body-snooping” or third-party sharing. In order to understand why physiological data is valuable, consider two perspectives: collection of data by the individual for the individual and big data collection by third parties in order to gain insight into the behaviour of populations. As demonstrated time and time again in the Quantified Self movement, accessing your own data is a potent tool for self-knowledge and greater understanding of behaviour. But crucially these data delivers valuable insight on a retrospective basis, the person makes a change to behaviour and uses these data to quantify the consequences of that behavioural change. I take my weight and blood pressure at time 1, join a gym at time 2 and repeat my measures at time 3. We can share these data with friends and family via social media and effectively create a crowd-sourced database. By sharing data, we are granting access to data from other people like ourselves and this provides greater insight/context to our own dataset as we use others to benchmark data from ourselves. One instance of this approach is precision medicine where people share information based on personal genetics, see this article about MeForYou.org as one example. In case this sounds like genetic tribalism, it’s obvious that the benefits of sharing your physiological data with others like yourself can be multiplied by ‘donating’ data to large databases in the interests of public health, leading to predictive health analytics and contributing to health insights on a national or even global scale (check out Christopher Murray’s TEDMed talk for an example of the latter). Consideration of public health brings us to the value of physiological data for other people besides ourselves. The current trend towards big data is partially about gaining insight through near-real time data feeds in order to manage a dynamic situation, but mostly about the predictive power of pooling data from individuals into large data sets. In this case, we’re talking about the contribution of your data to a bigger picture, whether this is health data, consumer behaviour or use of public transport. We know that public bodies and commercial organisations can wield big datasets very effectively in order to predict behaviour – see this striking example of policing strategy informed by machine algorithms from The Guardian. Crowd-sourced experiments is a QS concept (also see the recently launched Randomise Me website) where individuals can choose to alter their behaviour/donate data to a large dataset, thus blurring between data for the individual and big data sets. Ownership of physiological data would be implied by the fact that a person is asked to donate their data, in this case, payment for the data donation is received ‘in-kind’ by additional insight obtained through viewing the effects of an intervention on a group of people that included ourselves. There is also a fiscal model where our physiological data becomes a financial resource and we are paid in order to donate our data. The man behind the Scandu Scout puts forward this notion in this interview with Wired. But of course, if trading of physiological data is an eventuality in our sensor-enabled future, will we use this facility to gain insight into our behaviour and improve public health? Or for something more trivial – call me pessimistic, but I see the potential for a market for physiological data from celebrities and sportspeople. 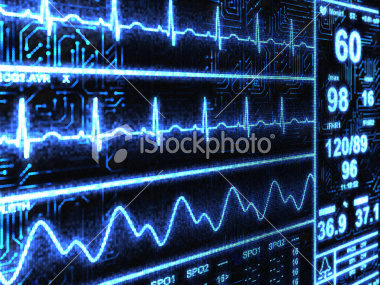 Sports fans could view live traces of ECG during the game in order to understand the level of exertion or psychological stress experienced by their heroes – and they would pay to do so. Celebrities could hawk physiological data of their significant moments (weddings, Oscar acceptance speeches) and people would probably pay for that sense of connection. Few of us are completely immune to the appeal of physiological data from significant persons. According to this article in Time magazine, an ECG from Neil Armstrong as he stepped onto the surface of the moon brought $12,500 dollars when it was sold in 2004. My point is that individuals must have ownership of their own physiological data before they can donate or trade on it. N.B. 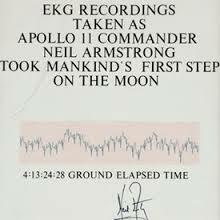 My suspicion is that Neil Armstrong did not get $12,500 for his ECG trace. Thanks to Jason Taylor for drawing my attention to the Randomise Me website.